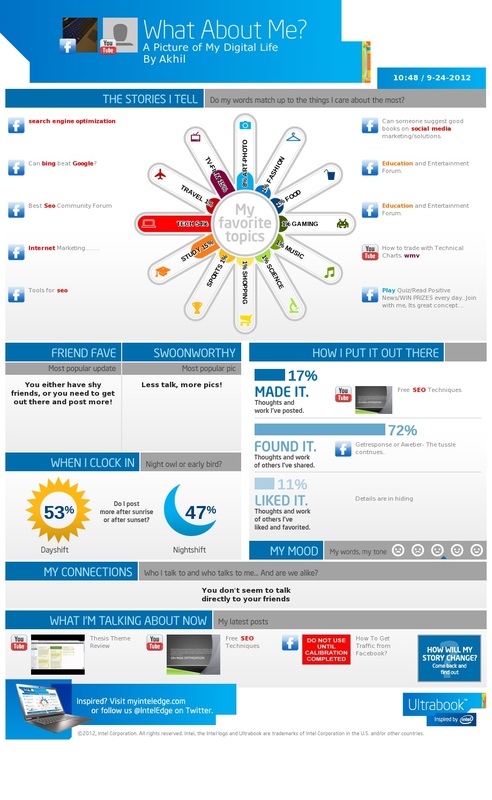 Social Media Info-graphics are very good way of expressing your social media profile. I have used a tool offered by intel to analysis my social profile. This tool from intel is called “What about me“. It is a fantastic tool to analyse your social profiles. It doesn’t allow me to add all of my social media profiles like all twitter profiles but still it is a very good way of looking into your own social media activities. I will suggest you to try it and play with it so that if not others, then at least you know what you are up-to. I am still working with it using my different ids to get view from different angles and if you want something similar, then intel’s what about me is a perfect tool for you. This looks like a good tool for both work and personal use. It looks like it can truly help analyze and improve all your social profiles. Yes that’s true michael, it is a extremely helpful, thanks for your comment.